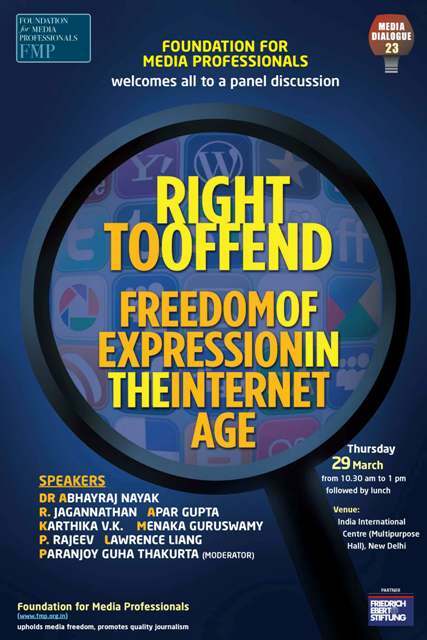 A debate is being organised by the Foundation for Media Professionals in partnership with the Friedrich Ebert Stiftung on – “Right to Offend: Freedom of Expression in the Internet Age“. Shuddhabrata Sengupta, artist, writer and Co-founder, Sarai programme at the Centre for the study of Developing societies. Paranjoy Guha Thakurta will moderate. missed out the recording part, sir. Please do upload the video recording of this event in case it is made.